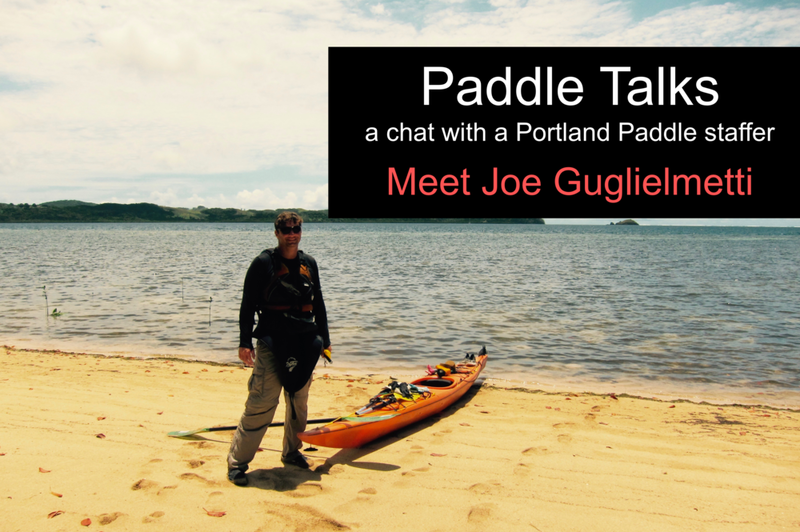 This month's Paddle Talk is a conversation with Joe Guglielmetti, a kayak guide who grew up in Cape Elizabeth and now lives on Munjoy Hill in Portland. Joe just returned from a kayaking expedition in Fiji. He repairs boats! I entered the guide world five years ago, and began work with Portland Paddle just hours after leaving the testing office. Do you prefer SUP or kayak or both? I usually guide kayak tours and teach kayak lessons, but every now and then you might catch me on a SUP leading a group around the harbor. What makes you want to guide? Guiding is a way to lead people through unique experiences in an environment that is often quite new to them. The natural and human worlds meld throughout the coast of Maine, and experiencing this reminds us that we are very much part of the natural world, not separate from it, and we must understand this natural world and treat it with care. This environment frames individuals' experiences and accomplishments, which can be multi dimensional, anything from physically paddling the distance from point A to point B, to seeing and hearing porpoises breach for the first time, to overcoming a fear of waves, to proposing to a girlfriend on a remote beach! I became a guide because doing so meant that I would spend more time on the water, and more time with people who want to learn. It is also a way to work while never truly feeling like I am at work. What's your favorite Portland Paddle experience as a guide? Paddling to Jewell Island is my favorite regular trip with Portland Paddle. Jewell island is the Jewel of Casco Bay. It is pretty far out to sea, and replete with history, natural wonder, and adventure. The paddle trip there and back exposes people to a wide variety of coastal scenery, wildlife, and interesting technical challenges. The Jewell trip also helps people learn how to pack a kayak with everything required for island living! What's one of your favorite paddling adventures? A fellow Portland Paddle guide and myself paddled around Manhattan two years ago. We rode the tide most of the time, encountered huge boats, big waves and currents, looked up at the bottoms of all of the historic bridges, and saw the urban environment from incredible and special angles. Often times I think paddlers rush to the back country for their expeditions, but urban paddling can be very interesting as well. Going back to the human being part of the natural world, I think the urban environment contains far more life that we often realize. An essential piece of gear or item to make a trip more fun/safe/enjoyable? One essential piece of gear is a spare paddle. In any boat, propulsion is critical to safety, and with any paddle craft, your propeller is your paddle. Having a backup is really important. I try to get as many people out on the water as I can. This includes friends, family, and coworkers in non-paddle sports jobs. Often times, people site pretty common fears as their reasons for not going, like "I have no upper body strength", or "I'm afraid of sharks", or "the ocean is just too dangerous". I would like to impress upon readers who are hesitant to try paddle sports that many fears we have of our physical capabilities and the technical and environmental challenges of the ocean are very real and rational, however many are out of proportion. One of the primary reasons to join a guided trip is to work with someone who professionally manages risk, and ultimately can expose you to just enough that you grow. I am a boat repair person! If you have a kayak or paddle board or canoe, or any other small craft that you would like repaired or beautified, get in touch with me!